1. How to Build a Girl by Caitlin Moran (review)- The character that really stuck with me after finishing The Casual Vacancy was Krystal. Sigh. When I think of British people living in “the projects” I have startlingly few reference points. Luckily, Caitlin Moran exists and her Johanna Morrigan nee Dolly Wilde presents a (very) Islightly rosier picture of a similar set of circumstances and thus we have landed on How to Build a Girl. 2. Cinder by Marissa Meyer (review)- Hear me out! Okay, so both How to Build a Girl and Cinder have awesome covers featuring ladies’ footwear. PLUS, when I hear a phrase like “how to build a girl” I begin imagining robot parts, so it’s only fitting that my favorite cyborg take the next spot on the list. 3. The Crimson Petal and the White by Michael Faber (review)- Cinder is a retelling of Cinderella, obviously, but you know what else was a retelling of Cinderella? Pretty Woman . Of course, Pretty Woman got all Hollywood-ed up with Julia Roberts and the 90s and all. However. If Pretty Woman were more realistic, set in Victorian England, and ended without the happily ever after, it’d be The Crimson Petal and the White. 4. The Language of Flowers by Vanessa Diffenbaugh (review)- I love love love this book by Vanessa Diffenbaugh, and it TOTALLY works with The Crimson Petal and the White because the whole “language of flowers” thing was a Victorian construct. Also Petal=Flower. Boom. 5. The Word Exchange by Alena Graedon (review)- Wordplay is my jam so jumping from “language” to The Word Exchange just seemed like the right decision. The Word Exchange sure as heck made me think about language differently. It also made me a little paranoid that my cell phone is plotting my untimely demise, but I digress. 6. Station Eleven by Emily St. John Mandel (review)- Word Flu to Georgia Flu seems plausible, no? Apocalypse all up in this piece! And there we have it! 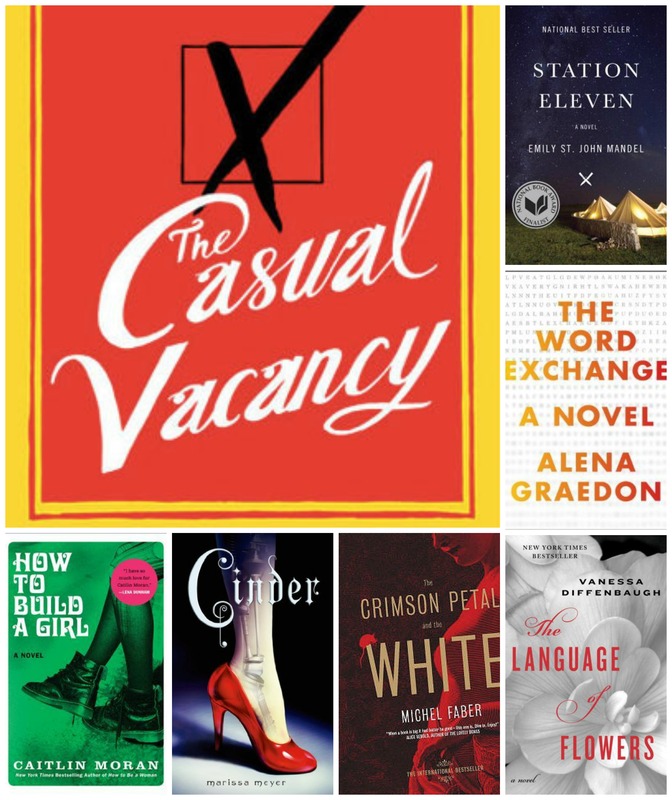 The Casual Vacancy to Station Eleven in six easy steps. Was that not a larking romp? Tell me Bookworms. Where would YOUR chain lead?! 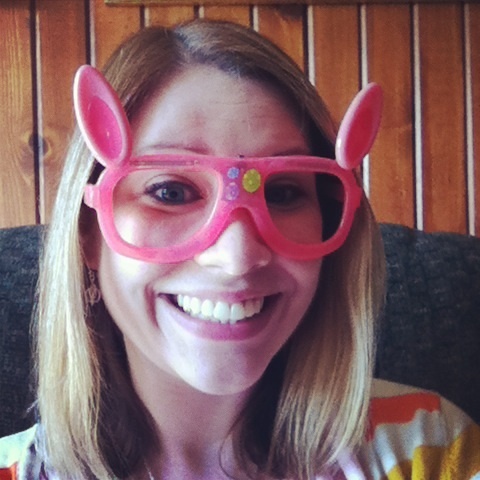 It’s time again for the most fun game in all the book blogosphere! 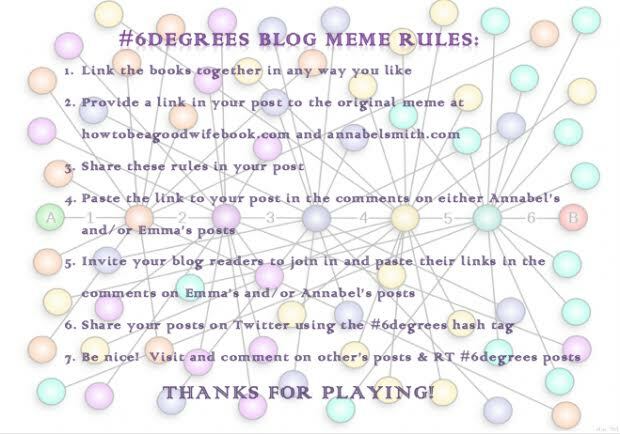 Six Degrees of Separation is the super fantastic meme put together by Annabel Smith and Emma Chapman. 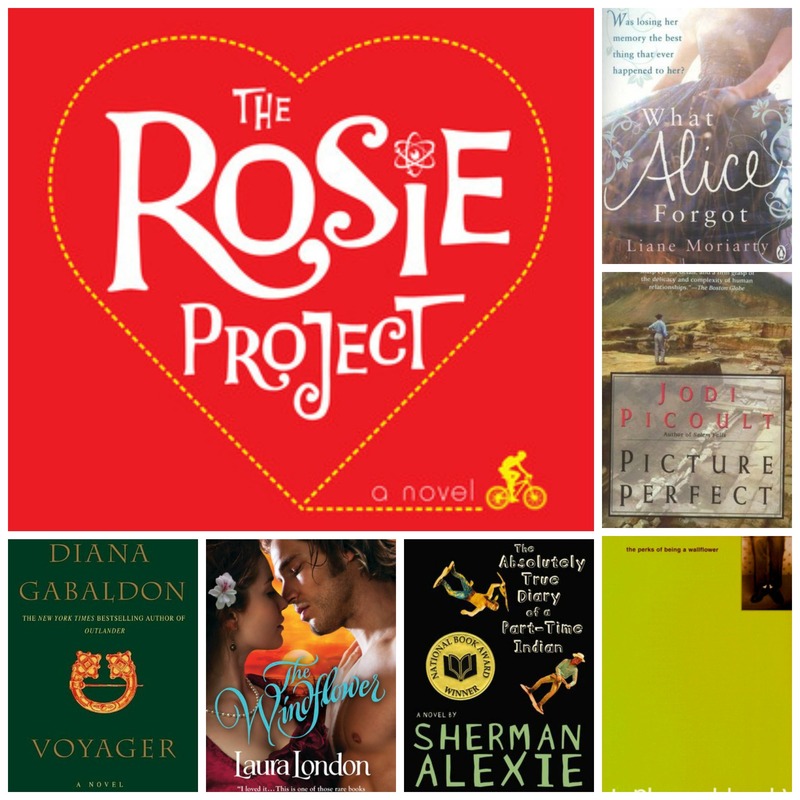 Emma and Annabel have chosen The Rosie Project (review) as this month’s jumping off point. Anybody up for connecting books via tenuous and occasionally ridiculous links? I know I am! 1. Because I had to mentally change my internal monologue’s reading accent partway through The Rosie Project after realizing it was set in Australia, not England my first connection is to What Alice Forgot by Liane Moriarty which caused me the very same dilemma. 2. The next stop on this crazy train is going to be Jodi Picoult’s Picture Perfect . The whole temporary amnesia thing in this book just wouldn’t NOT be connected to What Alice Forgot . I mean, these books could be cousins. 3. Next in line is The Absolutely True Diary of a Part-Time Indian by Sherman Alexie (review) because Will in Picture Perfect had the whole love-hate conflicted emotions going on with his life on the reservation juuuuust like Junior. 4. 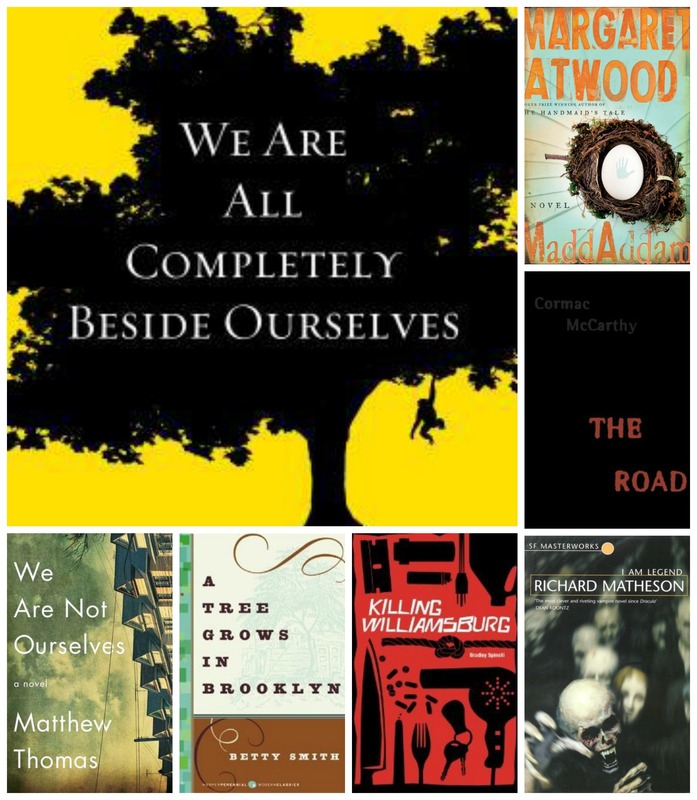 The Perks of Being a Wallflower by Stephen Chbosky (review) is my next link on the chain. Because teen angst. It abounds in both The Absolutely True Diary of a Part-Time Indian and The Perks of Being a Wallflower so it had to be done. 5. The Windflower by Laura London (review) is up next. Wallflower, Windflower. Potato, potahto. They sound alike. Nobody said I couldn’t use such a thing as grounds for linkage! 6. Finally, we’re ending with Voyager by Diana Gabaldon. The Windflower is a pirate-tastic romance on the high seas, so it’s only natural that I connect it to the volume of the Outlander saga with all the sailing and whatnot. Ahoy! There you have it. The Rosie Project to Voyager in six easy steps! What a ride! Talk to me Bookworms. 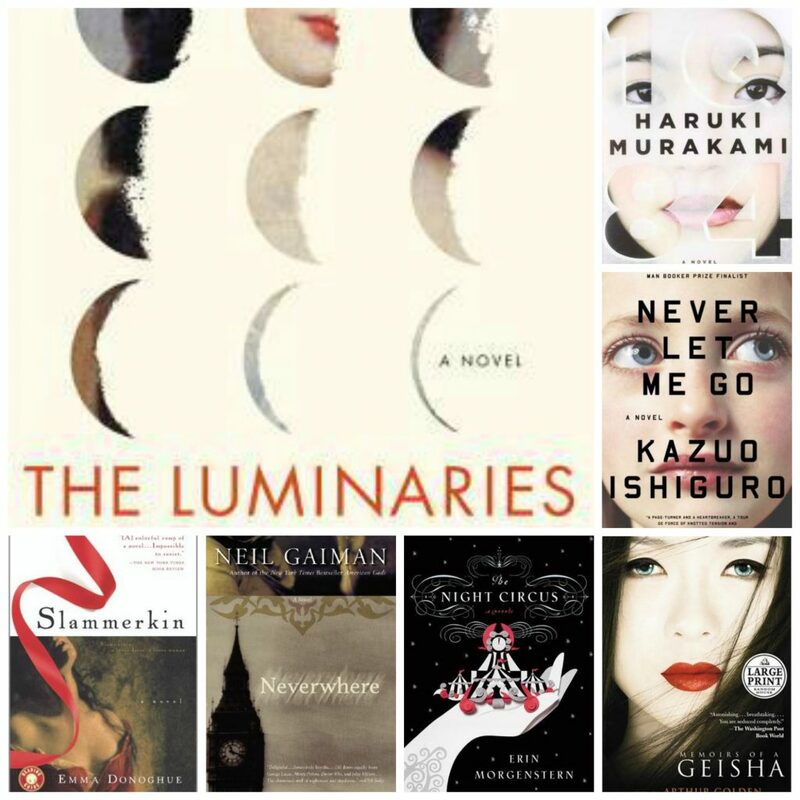 What are things that make YOU mentally group books together? Subject matter? Word association? Logic? 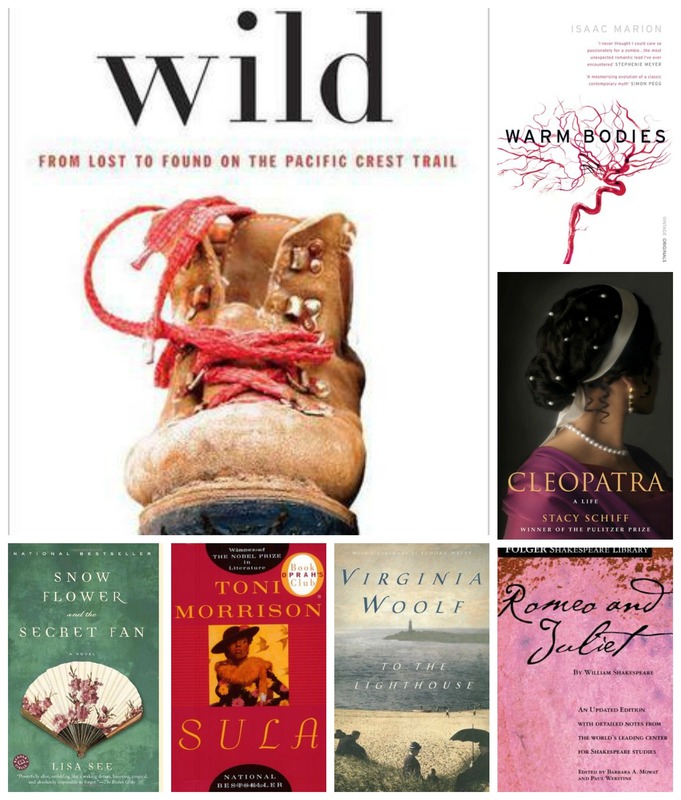 Six Degrees of Separation: WILD! It’s been a while since I played one of my favorite games, so I’m SUPER stoked to tackle Six Degrees of Separation for Wild by Cheryl Strayed (review). This game is hosted, as always, by Annabel Smith and Emma Chapman, who are both lovely and delightful. Just so you know the rules, I’m going to start listing books beginning with Wild and connect them via any old thing my heart desires. It can get pretty crazy in this noggin of mine, so you’d best buckle up. 1. Snow Flower and the Secret Fan by Lisa See (review)- Hear me out on this one. Cheryl Strayed’s poor feet were absolutely mangled by the Pacific Crest Trail. In fact, the only feet in literature I could think of who’d had it worse were the poor girls in Snow Flower and the Secret Fan who had their feet bound. Holy ouch, you guys. 2. Sula by Toni Morrisson- Snow Flower and the Secret Fan was at its heart the story of female friendship and misunderstandings. When I think of best friendships gone awry, I can’t help but think of Sula. 3. To the Lighthouse by Virginia Woolf- I read Sula in the same college class during which I read my one and only Virginia Woolf novel, To the Lighthouse. You guys, I think I’m just not smart enough to GET Virginia Woolf. 4. Cleopatra: A Life by Stacy Schiff- Speaking of lighthouses, what about the Lighthouse of Alexandria, y’all? Cleopatra had a kickass lighthouse. This non-fiction account of Cleopatra’s life taught me ALL THE THINGS. Completely fascinating. 5. Romeo and Juliet by William Shakespeare- What? I can’t very well include Antony and Cleopatra , seeing as I haven’t read (or seen) it. Besiiiiiiides, I now know the tragic ending and it totally works with R&J. For reals. 6. Warm Bodies by Isaac Marion (review)- Romeo and Juliet and Zombies. Boom. So there we are. Wild to Warm Bodies in 6 easy steps! Seriously, though, Bookworms. Is anybody keeping tabs on Kevin Bacon these days? 1. The Bluest Eye by Toni Morrison (review): I don’t have to have GOOD reasons to link books together, do I? 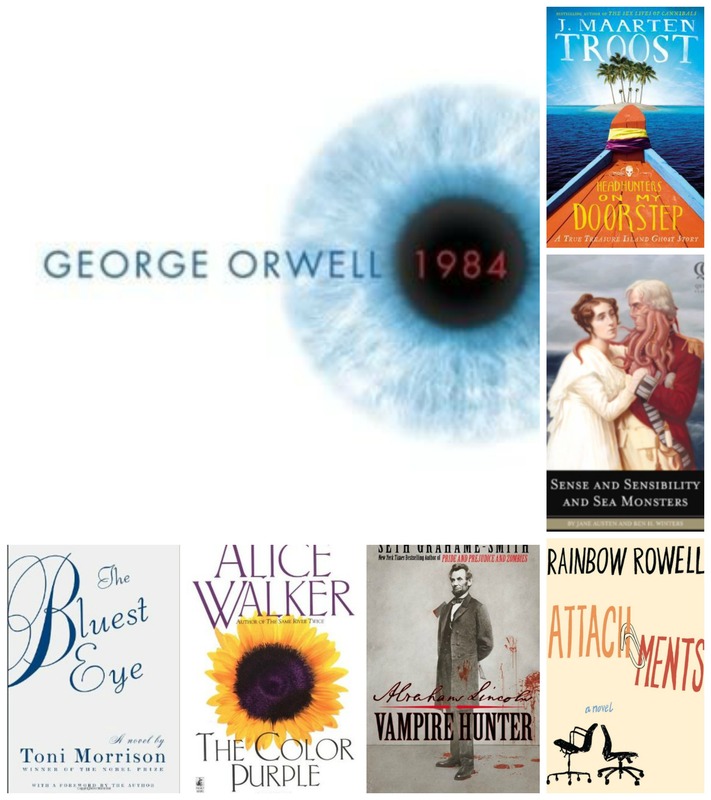 I borrowed my college roommate’s copy of 1984 and it had one large blue eye on the cover of it. I just don’t read that many books that feature eyeballs as cover art. It made an impression. Thus my decision to link to The Bluest Eye. 6. Headhunters on My Doorstep by J Maarten Troost (review): J Maarten Troost has adventures so you don’t have to. This book had me laughing so many times, I just can’t help but demand that people pick up some Troost. Next time you think it’s a good idea to move to an equatorial atoll, think again. It’s a wild ride, y’all. Gooooood times. And there you have it! Dystopian England to the equatorial atolls of the South Pacific in 6 easy steps! Have I mentioned I love this meme?! 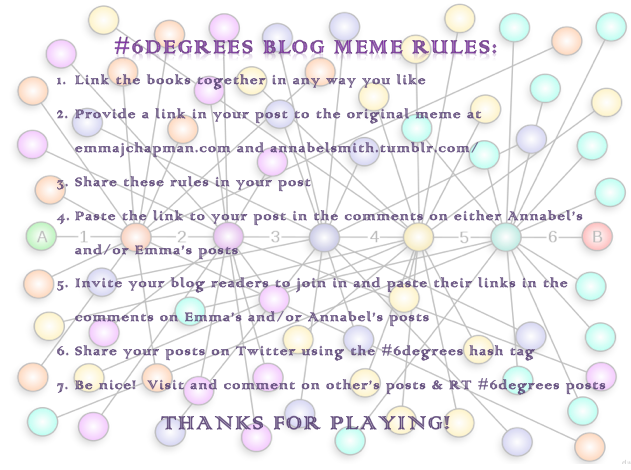 It’s time again for my favorite monthly meme, Six Degrees of Separation, hosted by Annabel Smith and Emma Chapman. 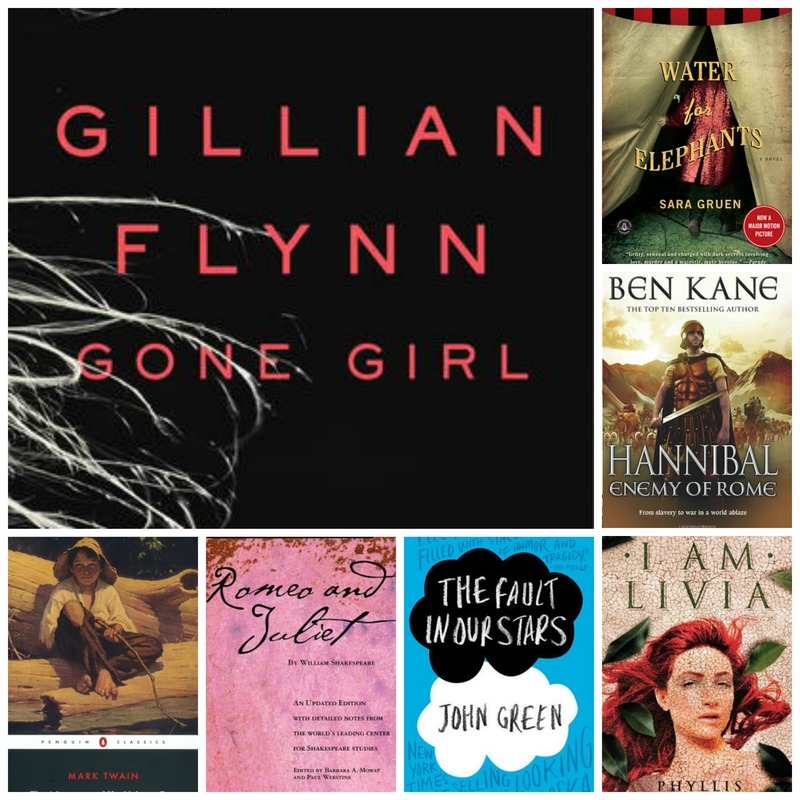 This month’s starting point is Gone Girl (review), which is awesome, as my HIGHLY SCIENTIFIC RESEARCH has shown that if Kevin Bacon were a book, he’d be Gone Girl . Kismet, no? 1. The Adventures of Huckleberry Finn by Mark Twain. My first stop on this crazy train is going to be in Hannibal, MO. (Bonus points if you now have “Shoeless Joe from Hannibal, MO” from Damn Yankees stuck in your head.) Gone Girl is set in Hannibal, MO whose most famous alumnus (before the Dunnes got all crazy up in there) is Mark Twain. Hence, the first book in my chain is The Adventures of Huckleberry Finn . 2. Romeo and Juliet by William Shakespeare. One of my favorite adventures of Huck Finn occurred when he landed in the middle of the Shepherdson and Grangerford family feud. It got me to thinking about literary family feuds so OF COURSE, I landed on the infamous antics of the Capulets and Montagues! 3. The Fault in Our Stars by John Green (review). How did I arrive here from Romeo and Juliet ? Well. Doomed lovers, for a start. BUT. The title The Fault in Our Stars is totally a Shakespeare reference. Unfortunately, it’s NOT from Romeo and Juliet , it’s from Julius Caesar . However, now that we’re in ancient Rome, my next book choice totally makes sense! 6. Water for Elephants by Sara Gruen. War elephants, circus elephants. Potato, potahto. We made it all the way from the crazy media circus of Gone Girl to the actual circus. With elephants. And now you know why I can never get anything done. This is how my brain works. Oye. 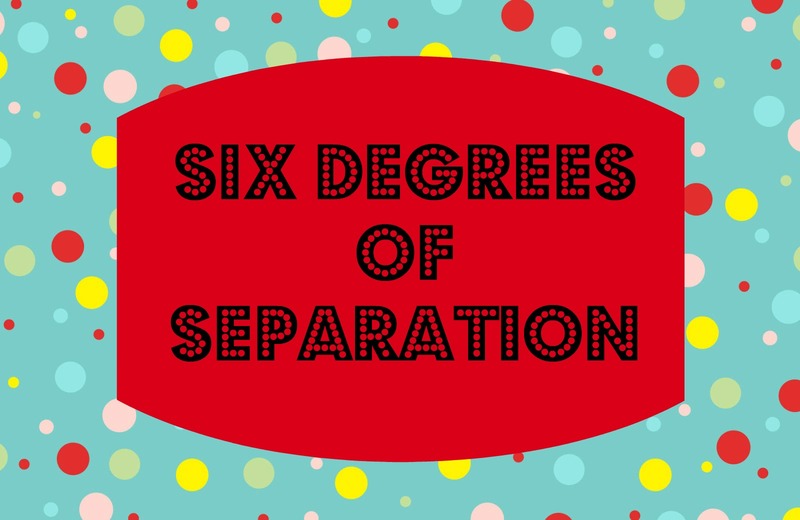 It’s time again for one of my FAVORITE monthly memes, Six Degrees of Separation hosted by Annabel Smith and Emma Chapman. They choose a book as a starting point, and then we create a chain of books connecting them in any old way we please. Seriously. I once connected two books using yogurt. It’s awesome. This month I’m happy to announce that I have indeed read the starting point book, The Goldfinch by Donna Tartt (review). Ready set? Let’s do this! 1. Les Misérables by Victor Hugo: Ooooh yes. I went there. Boris was my favorite character in The Goldfinch and seriously, if he had been born in 19th Century Paris, he would have been Gavroche! Gavroche was, no surprises here, my favorite character in Les Misérables. I love a plucky street urchin. 2. Gone with the Wind by Margaret Mitchell (review): I’m switching gears from Paris to Georgia here. Two sweeping epics full of political unrest and corsets? They didn’t specifically mention any hoop skirts in Les Misérables, but I’ve got my suspicions. And did you see Samantha Barks’s teeeeeeeeeny tiny waist in the movie version of Les Misérables? You know there were corsets all up in there. How could I not connect these two? 4. World War Z by Max Brooks (review): Vampires are mythological creatures that feed on humans, zombies are mythological creatures that feed on humans. It works. 6. The Handmaid’s Tale by Margaret Atwood (review): Speaking of terrifying potential dystopian scenarios can we TALK about The Handmaid’s Tale ?! Women sold and used as breeding stock? Women forbidden to read? Worst nightmare, much? There we have it! The Goldfinch to The Handmaid’s Tale in six easy steps… Including pit stops for corsets, vampires, and zombies. So much fun! Alright Bookworms, tell me something. 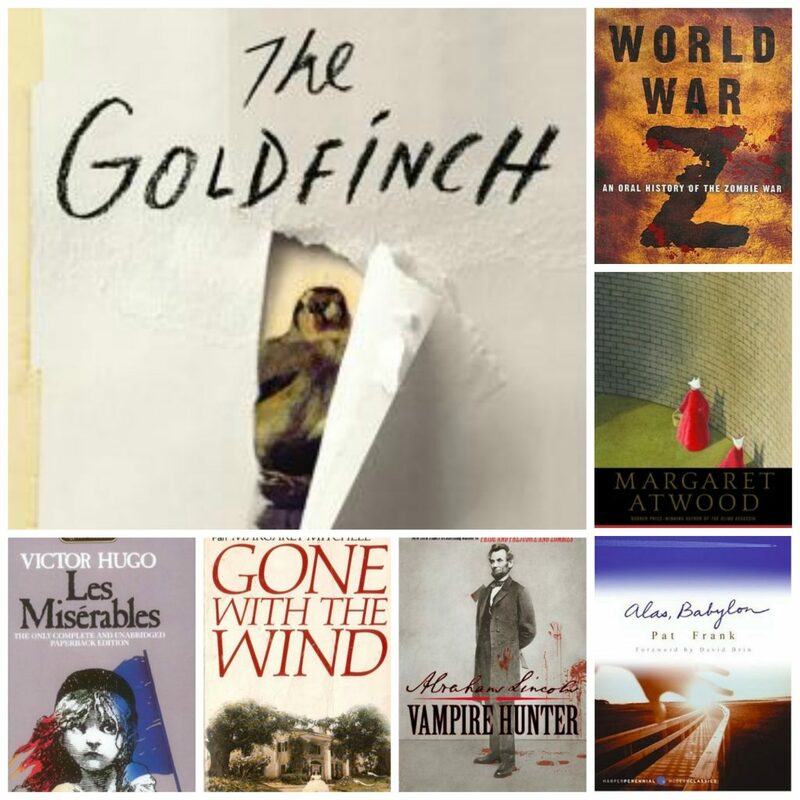 What book would YOU link to The Goldfinch ? It’s Tuesday, but I am forgoing Top Ten Tuesday list making this week in order to make a completely different list! That’s right, I’m talking about the awesome monthly meme, Six Degrees of Separation put on by Emma Chapman and Annabel Smith. 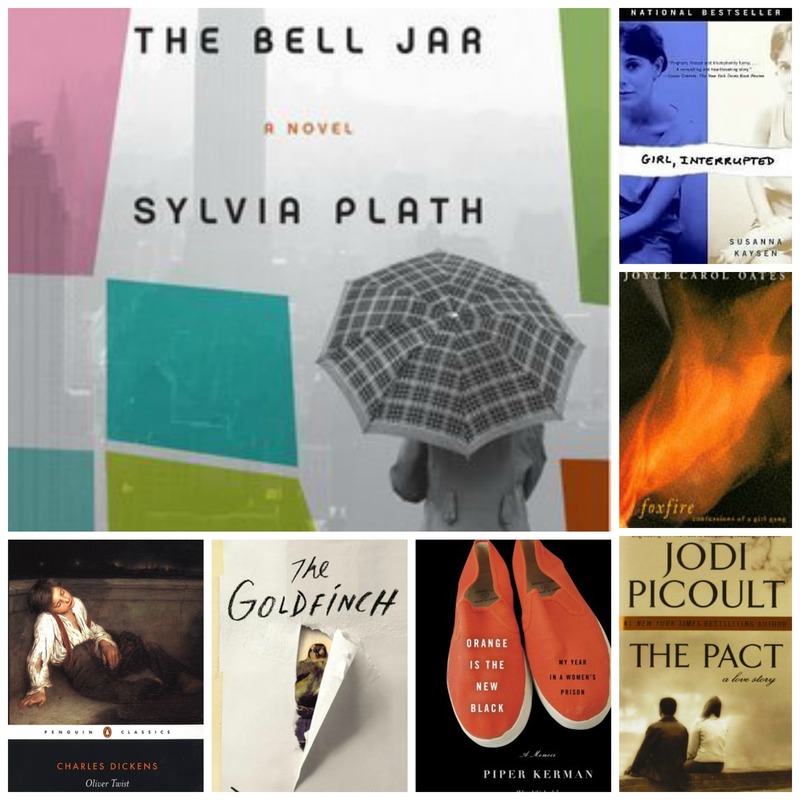 This month’s jumping off point is The Bell Jar by Sylvia Plath. I read this in college and found it to be crushingly depressing, but that’s fitting, as the main character struggles with depression and likely other mental illnesses. I’m not a psychiatrist, but the poor girl needs help. In any case, it will serve as a fantastic beginning to my Six Degrees of Separation chain! I recently discovered this fantastic new meme through Rory at Fourth Street Review that’s put on by Annabel Smith and Emma Chapman. Once a month Annabel and Emma will choose a book they both enjoyed. Readers will be tasked with creating a 6-degrees-of-separation chain beginning with said book. There’s a ton of room for creativity, because there are no guidelines on the connections. Whatever you feel is fair game, and that’s totally my kind of meme! 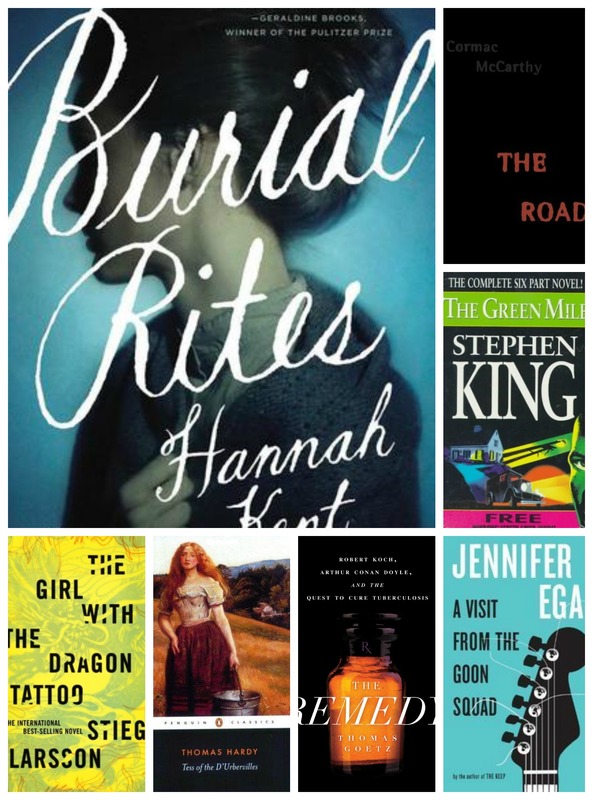 I know it might be a bit presumptuous to cheat this system since it’s my first time at this particular rodeo, but the starting point for this month was Burial Rites by Hannah Kent (my review). I actually came up with several different chains, but I liked the initial connections of all of them SO MUCH that I decided just to make a six lists of one separation… Or something. You’ll see what I’m talking about in a minute, I swear. READY?! 1. A Visit from the Goon Squad by Jennifer Egan: Alright, this connection is tenuous, I’ll admit, but these are the things that jump out at me. YOGURT. While reading Burial Rites , I kept googling things I hadn’t heard of, particularly the food. Skyr is a traditional Icelandic food that is apparently similar to yogurt. There was a point in A Visit from the Goon Squad where they discussed one of the girls’ mothers making homemade yogurt. I didn’t actually like the book but that whole yogurt thing made an impression. 2. Tess of the d’Urbervilles by Thomas Hardy: I saw soooo many parallels between Agnes and Tess! The tragic ends and the circumstances and the heartbreak. I just. Yeah. Agnes and Tess are like soul sisters. 4. The Girl with the Dragon Tattoo by Stieg Larsson: I couldn’t help but link this series to Burial Rites . It’s got to do with the whole Nordic vibe and the less than awesome justice system Lisbeth and Agnes were subjected to. Plus, the court representatives in both books were pretty big douche canoes, so, yeah. There we have it! Katie’s cheater-cheater version of Six Degrees of Separation. Are there any books that you might link to Burial Rites? Tell me about it, Bookworms!